Feather, flourish, or rattle throwing? Now, you may be wondering why I am posting two versions of the same card. I love white on white cards. Mine never seem to turn out so well as all the beautiful creations I see around Blogland, but Hey-Ho, I have Internet Connections to moan about. Anyway. I made the card with the flourish and was quit happy with the result. I turned away from my desk. And behold. A light bulb flicked on in my Fluffie brain and it said; (yes, light bulbs do speak.) Oooooooooooooh, a feather would look really pretty where that flourish is. A feather would look better than a flourish. So, you've seen my creation... I hope you have time to pop over to Sketch Saturday and see the fab work from the rest of The Saturdays and get all the details about the prize, very kindly donated by The Craft Barn. Wow, the white really shows up your gorgeous colouring. Love both versions, but if I had to choose I would say, mmmm, no feather. I love the swirl card, but I think the light bulb had a great idea too, both cards are lovely, and the Humpfrey image is adorable. Awwww Fluffy, this is so gorgeous....love the one with the feather most...your colouring is fab...you've got my address??? ?....lol....have a wonderful weekend! Morning Faye, Wow both beautiful cards. I think they are both gorgeous, personally tho - I would go with the feather. It gives a real come touch me feeling to your card. I think if I got that one I'd just sit and stroke the feather! Am so with you with the internet problems - we finally got broadband a couple years ago, after living with dial-up for years (something about us being in the back of beyond that thinks the current year is 1950 - we still have half-day closing on Weds around here!) and it's so much better, but it's not perfect. My laptop seems to cope better than hubbies PC, but neither of them are super-duper. We use a lot of soap in our house - for mouthwashing!!!! Faye this is sooooooooooooooo stinkin' adorable! I LOVE how you put the ink borders around the white. It looks great and I may just have to lift that idea!! As usual, your coloring is gorgeous too! Not sure which I like best, flourish or feather...they both look so nice! 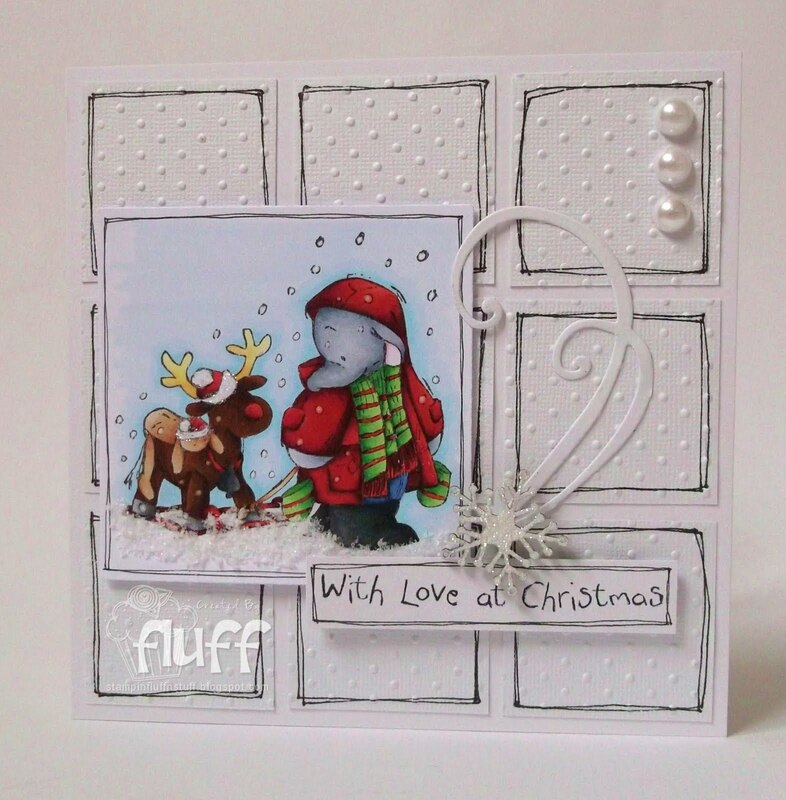 Hi Faye, your card looks beautiful both ways, but that feather does look good. Gorgeous card sweetie love it with & without the feather hun. Love the image. I don't know Faye, I like both of them. I think I prefer the flourish though only cause the feather detracts from your adorable image a bit. But that is just me talking, noth anyone important like a lightbulb! Both are wonderful! Love the white on white cards and this image is just the cutest. Like the flourish and also like the feather! As I said, both are great. Loving both cards your creations are always gorgeous and you have my sympathy over internet problems you know all about mine. "to flourish or not to flourish that is the question" well in fact I prefer the feather, softens up the whole look. 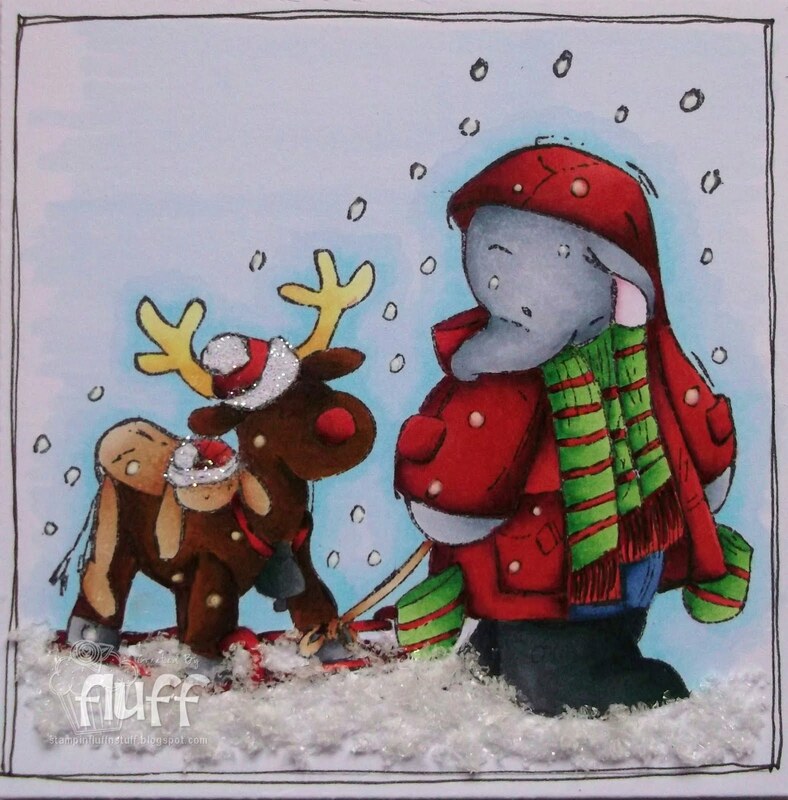 The image is fab, so cute. Great layout! The design looked simple yet it's gorgeous. Love the feather idea. Take the feather off its making me sneeze. Much better with the flourish. Muver. 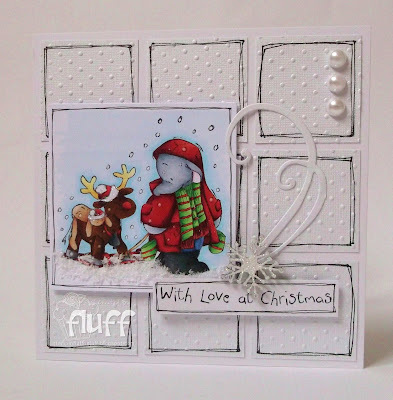 A syummimg card Faye, love the adrable image, love your amazing colouring even more. Feather, no, flourish, no, feather, no, flourish. Ooh! I can't decide, they are both gorgeous. Flourish or feather both are stunning!! I just love your doodling. Hope the internet connection improves. Don't even go there about internet connections, grrrrr!! Gorgeous, cute card Faye - love them both. Oh how you make me laugh Faye, I can just picture that flying out the window LOL!! I Love this card!! The coloring is fab and the the outlined white embossed squares are really beautiful! Oh my word Faye this is super, I so love that image also that beautiful embossed background truly wonderful. Wonderful white on white! Dandy doodlin and gorgeous colouring of Humphrey. Maybe the flourish on top of the feather would be the best option.